Substitutions? - Where To Get It? Choose a stainless steel bowl that fits inside a large saucepan without touching the bottom of the pan. Add water to the pan and place the bowl in the pan so that the bowl touches the surface of the water but still sits firmly on the rim of the pan. Remove the bowl, place the pan on medium heat, and bring the water to a boil. Place the cream in the bowl and place over the boiling water. Adjust the heat under the pan to medium, and heat the cream, checking the temperature often with an instant-read thermometer, to 190 degrees Fahrenheit, stirring occasionally. Stir in the vinegar, continuing to stir gently until the cream begins to curdle. Remove the pan from the heat, cover, and allow the curds to firm up for 10 minutes. Line a strainer or colander with dampened cheesecloth, napkin, or coffee filters. Set the curds into the strainer. 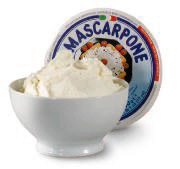 Allow the mascarpone to cool to room temperature, cover the strainer tightly with plastic wrap. Refrigerate for 24 hours to allow the cheese to finish draining and become firm. Use within 3 to 4 days. In "The Cook's Thesaurus," the following are suggested: (1) Blend 8 ounces softened cream cheese with 1/4 cup whipping cream, or (2) blend 8 ounces softened cream cheese with 1 tablespoon cream or butter or milk, or (3) Blend 6 ounces softened cream cheese with 1/4 cup butter and 1/4 cup cream (or Montrachet).